It’s called “gig” or on-demand work — short-term work arrangements based on specific, temporary projects. And it’s a growing trend in the work world today. In fact, a January 2019 ComplyRight Trend Survey revealed that 37 percent of the 427 small business employers surveyed use gig workers (also called freelancers or independent contractors). That’s more than 1/3 of their workforce, a number in line with national statistics. Are your business needs changing in the direction of more freelance work? If so, when does it make the most sense to work with independent contractors — and what are the requirements for a proper, legal relationship? Let’s look at the key factors impacting your workplace as the gig economy heats up. Working with independent contractors offers distinct advantages for your small business. It’s often more affordable because you don’t have to pay taxes, social security or benefits. Further, you have the flexibility to obtain the exact services you need, when you need them. For example, let’s say you need to build a website or promote your business to a new set of prospects. In clearly defined instances like these, it makes more sense to contract with a web developer, marketing consultant or other professional freelancer on a temporary, per-project basis. When it’s time to contract out certain jobs, you’ll find that many professionals today are more interested in gig work than traditional, full-time employment. In general, gig workers are motivated by flexible hours, the ability to create their own schedules and the potential to earn more than they could in a typical salaried or hourly position. Technology certainly plays a starring role in this changing dynamic, as well. Rather than being restricted to a standard office setting, more workers can perform their jobs from home or remotely with the use of laptops, internet access, file-sharing platforms and online apps. As the gig economy grows, you may find contractors more readily available and appropriate for certain business needs than traditional employees. Before you turn to freelancers, consultants and other independent contractors to support your business operations, you must recognize the differences in the working relationship. 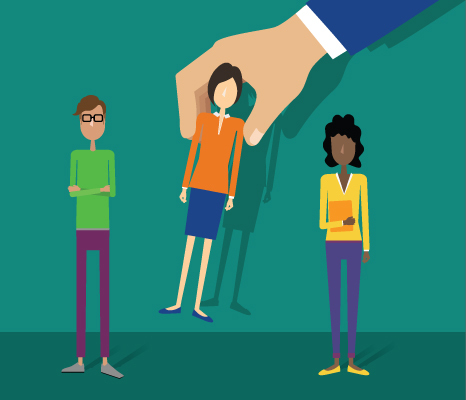 The IRS and Department of Labor (DOL) expect these workers to meet certain criteria that distinguish them from employees. 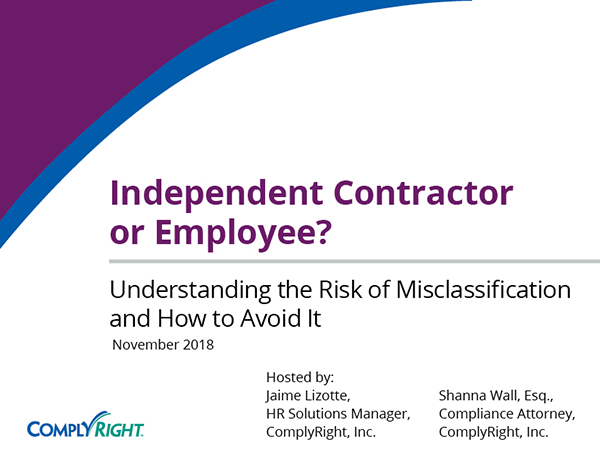 Get it wrong and you run the risk of misclassification, which carries legal and financial consequences. Remember: The worker is not an employee. You must avoid micromanaging the person’s day-to-day activities — and only focus on their final results — to uphold the proper legal arrangement. Get expert direction on working with independent contractors, particularly the various legalities that apply. For example, to meet your legal and tax responsibilities, be certain workers complete a W-9 form before beginning any project. You’ll need this form to issue a 1099 and report taxes by January 31 the following year. Be aware, too, of the importance of an independent contractor agreement. Having an individual sign an agreement helps ensure everyone is clear on the terms and conditions of the relationship.